Liberian county flag design includes always the national flag design on the upper hoist (about 1/4th size) and the remaining field filled with a particular design. While some show a particular element on the (lower) fly and an otherwise plain field (Bomi, Grand Bassa, Margibi), others use up the space in full. Sometimes the the national flag design on the upper hoist seems to be a part of the design (River Cess, Grand Kru), others it appears to have been added as an afterthought (Nimba, Maryland). Grand Cape Mount is something of an exception, with the national flag design yes on the upper hoist but not touching the border for design reasons. The basic motif, with the national flag in canton, is kept — as has happen also with the newer four flags (Bomi, Grand Kru, Margibi and River Cess); the only (partial) exception, Grand Cape Mount, is one of the original lot of nine. The book [smi75b] shows, I believe, the same shade of green for all these flags, but Montserrado is hard to judge, as it has the green directly against a greyish blue background. These flags were presented to the Liberian counties by President William V. S. Tubman on 29 November 1965, his seventieth birthday. What happened with those flags later on? Were they “bunkered” in some county house safe, or hoisted in county official rooms, or whatever? Were they produced uniquely (only this once), or where there made more of such flags (even mass produced?). Were they used later on, say on stamps, tourist publications etc? And, finally, what happened with the flags after the end of President Tubman rule? These flags are officially in use but rarely used out of the provincial government headquarters. I think that the related flags were created in 1965 and even if the number of provinces increased since then, it is unlikely, considering the political situation of Liberia, that any additional flags were created after about 1990. It is nice to see a confirmation of these elusive flags, but I’d prefer a cloth flag photo, as it would be more real than just a web image nicked from somewhere. Does anybody have information on the current status of the Liberian county flags? Have they been used (in cloth) over the last, say 20-30 years? Or only (in transmogrified form) on the internet? Photo of county flags, hoisted at the presidential palace, in the official website. Nice to see these flags finally in use, for many reasons. On the website of The Grand Gedeh Association in the Americas Incorporated the flag of the Grand Gedeh county is shown. The flag of Nimba county is shown on the website of the UNICCO — United Nimba Citizens’ Council. Here’s an actual image showing the Montserrado County flag from the ForeignPolicy.COM website. 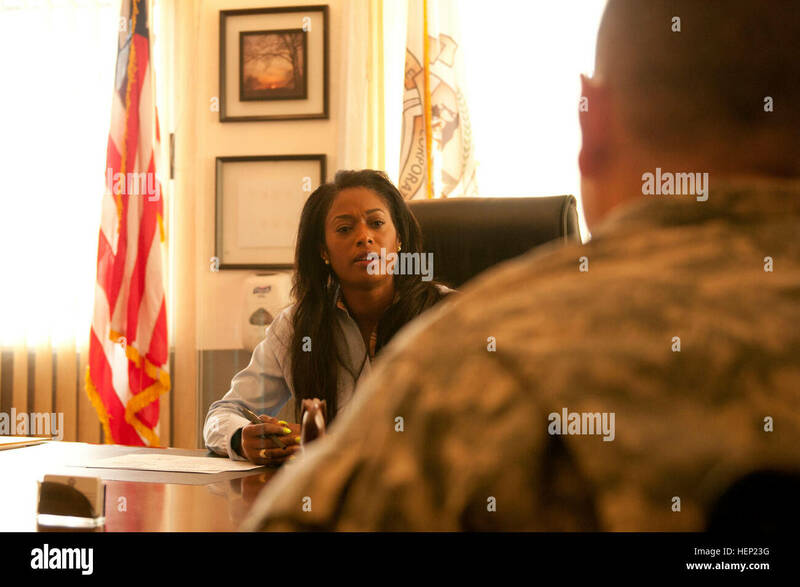 The image caption says that «Josephine George-Francis, governor of Montserrado County, sewed the Liberian flag that hangs in her office». The actual usage of county flags seems to be confirmed. 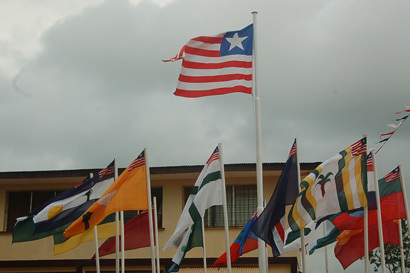 Very interesting photo showing the central part of the flag of the City Corporation of Monrovia, Liberia, [at the official weblog]. A plain white flag with a large depiction of the city corporation arms centered on it. The arms are quartered Sable and Argent on the I a key Argent, on the II a palm tree issuant from an earthy compartment proper, on the III a different kind of tree likewise, and on the IV an elephant statant trompetant dexter, and on a chief Azure a sun Gules nimbused Argent setting on a sea proper throughout and an estoile faceted Sable and Argent, both offset to the sinister. White scroll reading in black capitals "The City Government of Monrovia" above "The Monrovia City Corporation". This coat of arms seems to be pre-existing to the flag, or at least to its current bearer, judging but the latter�s modern-sounding name. The flag consists of the logo (https://monroviacitycorporation.files.wordpress.com) over a white horizontal background. "Monrovia was established on April 25, 1822 and it was named in honor of U.S. President James Monroe, a prominent supporter of the colonization of Liberia and the American Colonization Society (1817-1964). Municipally, Greater Monrovia District is one of four districts located in Montserrado County. Greater Monrovia has no official administrative status. Unlike other districts of Liberia which are divided into clans, Greater Monrovia is divided into zones. Greater Monrovia is subdivided into two city corporations (Monrovia City Corporation and Paynesville City Corporation) and ten other local authorities (nine townships and one borough). Established by law in 1973 and operational since 1976, the Monrovia City Corporation (MCC) is responsible for the city's administration, as well as providing services to the townships and borough through a revenue-sharing arrangement, but has no zoning or enforcement jurisdiction in them." "Paynesville (sometimes Paynesward) is a city which often considered a part of the Greater Monrovia area, one of four Districts located in Montserrado County. The city was established in 1865 and it is governed by the Paynesville City Corporation." As Tomislav pointed out, the city flag is the logo over a white horizontal background, surrounded by a golden fringe.